Daycare - Play With Us. 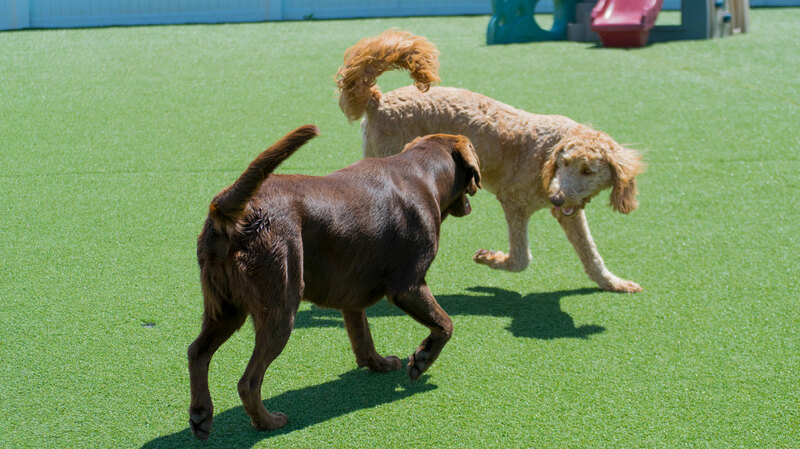 Daycare at 4 Seasons Pet Resort is a great way for your dog to socialize with friends or just get the sillies out on a blustery day. Dogs over 25 pounds will enjoy 5200 sq. ft. of indoor and outdoor play space, while dogs under 25 pounds have their own designated play areas covering 1100 sq. ft.
Our securely fenced outdoor spaces feature cushioned play turf and indoor spaces have sealed concrete flooring for easy sanitation. For athletic and adventurous dogs, all yards have a variety of fun play equipment, including kiddie pools in warmer months. Our daily schedule is designed to ensure your pet is getting the most beneficial and low stress experience possible during their stay, but it’s not all fun and games at 4 Seasons Pet Resort. Rest and quiet time are equally important. When it’s time to chill out, your dog will enjoy our roomy kennels with comfy bedding, a treat-filled Kong, soothing background music and aromatherapy for maximum relaxation. We understand that group play isn’t for all dogs, but all pets deserve a safe place to go while their owners are away. We offer private play for those dogs who don’t enjoy socializing with others, for seniors who need a little slower pace, and for dogs who need more one-on-one time with our staff. Dogs in private play will have morning and afternoon one-on-one with one of our attendants and three potty breaks. Our private play area is 650 sq. ft. and our luxury suite private play area is 630 sq. ft. Refer a friend and receive 1 free day of daycare. Please call 734-744-8062 if you are running late for pickup. $10 fee will apply for late daycare pickup. After 10PM, all dogs in the facility will be boarded overnight and can be picked up the following morning. Additional fees for food and boarding will apply.